use our online contact form to submit your questions or comments. We welcome payment through Visa, MasterCard, American Express, Discover, Check by Telephone, PayPal® and Government Purchase Orders. Invoice terms for pre-qualified customers are Net 30 unless otherwise arranged in advance. A 1.5% per month finance charge will be assessed on all late payments. A $20.00 charge will be assessed on checks drawn on accounts with insufficient funds. All shipping charges are based on the weight of the product(s) that are ordered and the destination "Ship To" zip code. We calculate these costs by using United Parcel Service's (UPS) rate calculator. Remember, UPS ground shipping for AEDs and all orders $99 and over are always free within the 48 lower contiguous United States. International customers have several shipping options available when ordering by telephone. Customs charges, taxes and fees are the customer's responsibility. How to predetermine your shipping costs: Since we calculate based on the product weight and the ship to zip code, we cannot quote shipping charges until we have your delivery information. In order to see the shipping charges you will be charged, simply add whatever items that interest you into your shopping cart and go to checkout. You will then be asked for your delivery address and zip code. After you enter that information and submit, you will see the freight charges. You can cancel your order at any time if the freight charge is not agreeable to you. Since all of our products come in various sizes and weights, and since we use UPS's rate calculator which bases costs on zip code information, we cannot offer a standard shipping table indicating the freight costs. Please note: Any orders you place that exceed 150 lbs. in total weight will not have shipping fees noted on your order confirmation. Instead, freight charges will be calculated manually by the AED Outlet after your order is placed. The reason for this is that the online calculator from UPS cannot differentiate between individual items being purchased and calculates the freight based solely on total pounds incurred. We manually convert shipments of 150 lbs. or more into smaller parcels for UPS acceptance. After we contact you with your freight charges and your final total, you are never under any obligation to continue with the order if you feel the charges are unacceptable. That is our promise to you. Street addresses are required: We currently ship most orders to U.S. destinations via UPS ground service to business and residential addresses. We cannot ship to PO boxes because UPS will not deliver to them. If you need expedited freight service on an item, contact us at 877-233-4911 for assistance. Additional charges will apply. If you have any further questions, please use our online contact form. All automated external defibrillators (AEDs) sold by the AED Outlet include a minimum of a 3-year warranty. Please contact us via email, phone or mail for all warranty service and technical support questions. 1. You may receive a refund or credit on most items within 30 days of delivery. Items must be in their original packaging. Before we can accept your eligible return items, you must call us at 877-233-4911 to obtain a Returned Merchandise Authorization (RMA) number. Write the number on the shipping label of each box to be returned so we'll know how to process your refund. Items returned to us without original and undamaged packaging, or without an RMA, will incur a 15% restocking fee. Returns beyond 30 days will not be accepted. 2. All items purchased from the AED Outlet may be returned under this policy except opened electrode pads or those with damaged packaging, opened rescue kits and packs, used batteries or those with opened packaging, used manikins, books, software, videos, CDs, DVDs, extended warranties, online training passcodes (once issued) and classroom training (once it's scheduled.) If you are returning an automated external defibrillator (AED) or training unit, the price of opened electrode pads, opened or used batteries, or items in opened or non-resalable condition will be deducted from the refund. Training purchases and AED management services are not refundable once scheduled or online passcodes have been issued. 3. Shipping and insurance costs on returned items are the responsibility of the customer. For your protection, we urge you to ship returns insured using a reputable carrier who will issue a tracking number for the shipment. 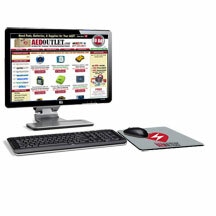 Allied 100, LLC is not responsible for customer returns that are lost or damaged during shipping. 4. Items not purchased from the AED Outlet may not be returned to the AED Outlet. For information about Security, please visit our Security Policy Page. How to find items: There are several ways to find what you want. AEDOutlet.com is searchable (see search box at top of page). For every item, there will be an Add To Cart button. This button adds the item to your Shopping Cart. Putting something in your shopping cart does not commit you to buying it. After you put something in your shopping cart, you can choose to place the order immediately, or continue shopping. You can put as many items as you want in your shopping cart. When you are finished and want to place your order, click Checkout under your cart in the right hand column.